Those of us who cook typically aren’t content to keep it to ourselves. Our communal tradition of food demands some sort of audience—whether it’s coworkers peeling back the foil of a still-warm coffee cake or strangers liking the Instagram shot of your pad thai (#nom). When such sporadic appreciation fails to satisfy our egos, we tend to go big—and go home. In other words, we throw a dinner party. My early attempts at such gatherings were laughably over-the-top. One Valentine’s Day I cooked up an Italian feast featuring a salad of exotic greens, from-scratch foccacia, sun-dried tomato spread and two kinds (why?!) of lasagna. Dessert was a chocolate mousse served in edible shells, painstakingly created by painting layers of melted chocolate into mini-cupcake liners. I can’t remember who we invited, but the chaos that remained in our dishwasher-less kitchen is burned in my memory forever. Not only were these parties time-consuming (and expensive), I suspect I isolated more people than I impressed. I usually spent more time at the stove than I did with the guests, marooning Jason in the living room with a lovely plate of crudités and six semi-strangers. When friends reciprocated the invitation, we were often met at the door with an apology (“Sorry, we’re just having pizza…”) as if their company was only as valuable as their menu. As much as I love cooking, I love people more. I want to spend my Saturday nights with friends, not a finicky saucepan of créme anglaize. I want to send people home with a bevy of inside jokes and abs that ache from laughing. I want to be left with good memories, not a pile of dishes. So when I suggested (somewhat timidly) that we invite some of Jason’s coworkers for dinner this weekend, I promised I would scale it back. We used paper plates and plastic cups and asked friends to bring the wine. I opted for a make-ahead menu of guacamole, fruit salad and brisket tacos (which could be warmed and ready in the oven before the first guest arrived). People congregated around the food but they didn’t talk about it. It was a backdrop to the gathering, not the star. By the time we dove into these brownies, I realized I was having fun at my own party. “Done,” I replied with satisfaction. That’s a gathering worth raising a glass to—even if it’s a Solo cup. Don’t let the cayenne scare you away. 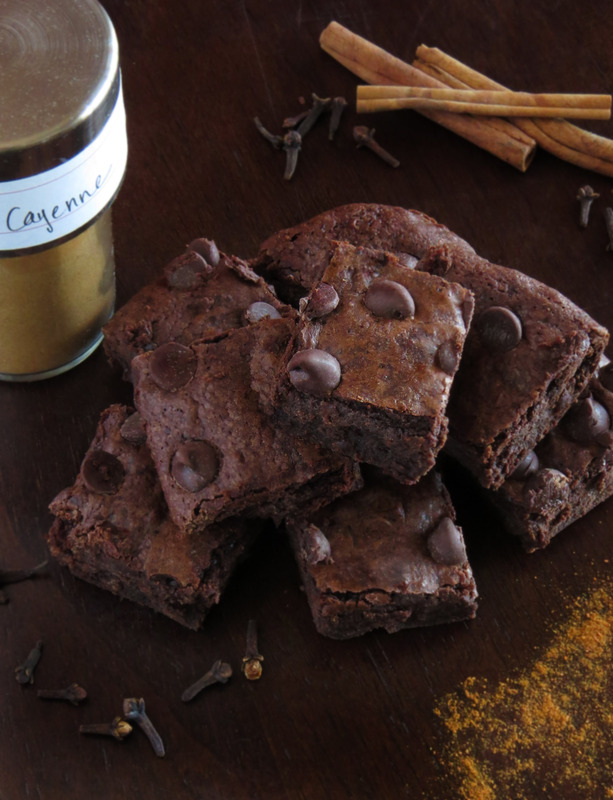 These deeply rich, subtly spiced brownies (adapted ever-so-slightly from Scientifically Sweet) won’t send you flailing for something to drink. From the moment each morsel enters your mouth, the flavors begin evolving from bittersweet chocolate to aromatic cinnamon and cloves. The tiny kick (a nudge, really) of heat hits right at the end; serve with a chaser of vanilla ice cream and you’ll get no complaints. Preheat oven to 350°. Line a 8×8 baking pan with two pieces of parchment paper, leaving a 2″ overhang on each side. In a large, microwave-safe bowl, heat the chocolate and butter on high in 15- to 30-second intervals, stirring in between. When only the smallest fragments of chocolate remain, remove from microwave and stir until completely smooth. Beat in sugars until thoroughly combined, then add eggs (one at a time) and vanilla until batter is smooth and glossy. Stir in flour, salt and spices until evenly distributed. Pour batter into prepared baking pan and sprinkle with chocolate chips. Transfer to the middle rack of your preheated oven. Bake 23-27 minutes, or until a toothpick inserted into the center of the pan (but not through a chocolate chip) comes out crumby, not wet. Cool completely before slicing. these look delicious Chelsey! i also very much agree with everything you said in your post. i am so glad that you love people the way you do. 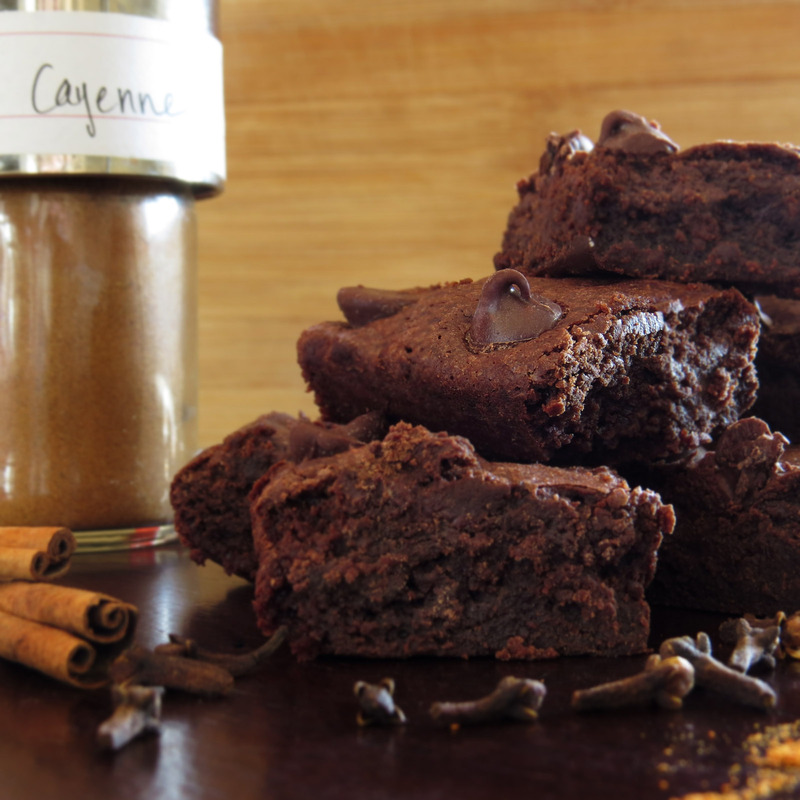 Love the combination of spice and chocolate.. and what a delicious idea to use both flavours in a classic brownie. I bet these tasted wonderful. Thanks for your sweet comments! I caught up on all of your lovely blogs this morning. I have such creative, insightful (real and virtual) friends!